Gail Davies Producing Webb Pierce Tribute Album. Gail Davies will begin production next week on Caught in a Webb, an all-star tribute album to Webb Pierce. The project will feature such luminaries as Mark Knopfler, George Jones, Willie Nelson, Lucinda Williams and Dwight Yoakam. Pierce dominated the country charts during the 1950s, outstripping such formidable competitors as Eddy Arnold, Lefty Frizzell and Jim Reeves. Proceeds from the album will be given to the Minnie Pearl Cancer Foundation, Davies reports. All participants are donating their services. "WHEN COUNTRY MEETS ROCK" - hosted by singer, musician - PAUL DELICATO - is a TWO part show with traditional country music for listening and dance, and features "Miss COUNTRY AMERICA" - SUSAN HUDSON, and Branson's Own, WALLY BARBEE, and the newest BRANSON "LIVE ENTERTAINMENT CAPITAL of the WORLD" artist, MELISSA RABON. Well known singer-songwriter & fiddle player, JOHN PERMENTER is also featured in shows playing Germany, Switzerland & Latin America. The Second half of "WHEN COUNTRY MEETS ROCK," features WAYNE CARMAN, book author of "Elvis's Karate Legacy," friend, Martial Arts training partner and has been inducted in the US BLACK BELT HALL of FAME & The WORLD BLACK BELT HALL of FAME. The Second half highlights Elvis tribute entertainer JAY ZANIER, with vocal backings by SUSAN - WALLY & MELISSA and special featured artist / musician / drummer, and long time friend, BILL LYNN, who worked with Elvis in many of his movies (1964-1970), and a few of his recordings. Also, on display, will be one of Elvis's Karate Gi's, Karate belt and sunglasses. After the show, there will be available for personal autograph's, photos of Elvis with WAYNE CARMAN & BILL LYNN, including WAYNE CARMEN'S book "ELVIS'S KARATE LEGACY," containing many rare, previously unpublished photos of Elvis, his family tree, and his more than 15 years of love and devotion to the Martial Arts. We will have a Raffle at the last show in Europe (from show ticket entrants), for a fabulous FREE HOLIDAY in BRANSON/Missouri covering 7 days / 6 nights and 6 live music shows! (Sorry, airfares extra!) If you are interested in hosting this SPECTACULAR - ONE OF A KIND SHOW - (show fee - under $3,000.00 US per show, transportation included) either in it's full performance, or the country or rock separately, please contact us direct for further details and information. Country music, like the market, going through turbulent times. From the Atlanta Journal-Constitution. The actual Business Week piece is only available online to paid subscribers. Dennis the Menace' Creator Dies. Hank Ketcham, whose lovable scamp "Dennis the Menace" tormented cranky Mr. Wilson and amused readers of comics for decades, has died at age 81. Ketcham had suffered from heart disease and cancer. Ketcham stopped drawing the weekday strip at the end of 1994 but let it continue under a team of artists and writers. Inspired by the antics of his 4-year-old son, Ketcham began the strip in 1951. In March, Ketcham's panels celebrated 50 years of publication ÷ running in 1,000 newspapers, 48 countries and 19 languages. Despite its longevity, the strip changed little since the 1950s. Dennis was always a freckle-faced "five-ana-half" - an appealing if aggravating mixture of impishness and innocence. Henry King Ketcham was born March 14, 1920, in Seattle and grew up there. He recalled he was no more than 6 when he knew he wanted to be a cartoonist. One day he watched a family friend sketch Barney Google and other then-popular cartoon figures. In 1938, he dropped out of the University of Washington after his freshman year and went to Southern California to work as an animator, first for Walter Lantz, creator of "Woody Woodpecker," and then for Walt Disney. Ketcham worked on "Pinocchio," "Bambi," "Fantasia" and Donald Duck shorts. When the United States entered World War II, he enlisted in the Navy, where he was put to work drawing cartoons for Navy posters, training material and war bond sales. The cartoonist moved to Switzerland, where lived in Geneva for 17 years, relishing the peace of being thousands of miles away from business associates. He returned to the United States only infrequently and used the Sears catalogue to keep abreast of details of the changing American way of life for his strip. He stopped drawing the Sunday strip himself in the mid-1980s but carefully supervised the process. He kept up the weekday strip until the end of 1994. JACK SCOTT ... It's a "Canadian Thing" Warren Cosford Speaks Out. Many of you know that I've been a fan of Jack Scott's since I was a teenager. Actually, it's been a source of amusement for many of my friends and the people I've worked with over the years. Most don't "get it". For example a Canadian Internet "Broadcast" facility lists ONE Jack Scott record on their Rockabilly Site. And that is one more than 1050 CHUM were playing in their final days. That's not only amazing ... it's astounding! Who ARE these idiots? Well...in one case they're Idiots who failed. In the other they're Idiots who are getting ready to fail. What first drew me to Jack was the fact he is Canadian born in Windsor. In 1958 I'd never heard of anyone who sang Rock and Roll who was Canadian. Yeah ... I know ... Paul Anka charted Diana in 1957. But that wasn't Rock and Roll. Anka only ever wanted to be Frank Sinatra. Diana et al was Paul and a bunch of studio musicians in New York. Paul quickly moved to Las Vegas. Jack and his band first recorded in Detroit's only studio. They had a "regional hit" in '57. Beginning in June of 1958 Billboard charted 19 more in 41 months. Jack's background vocal group The Chantones were from Windsor. There were very few Rock and Singers who charted through the era of the Payola Hearings. While producing The Evolution of Rock for CHUM in 1975 Jack and I became friends. More of The Story is here: http://www.rockabillyhall.com/JackScott.html. I've done everything from arranging for his first Greatest Hits album (Al Mair at Attic is a fan) to singing with him on stage at a Buddy Holly Memorial in Clear Lake Iowa headlining a show that featured Carl Perkins and Wanda Jackson. No small feat considering I can't sing. At any rate ... in typical Canadian fashion, his contributions to the early days of Rock and Roll have never been acknowledged in Canada. I'm not sure he cares. But I do. Recently, in England, Robert Plant requested a personalized autograph. In Winnipeg, so did Burton Cummings. But to The Canadian Music Industry Hall of Fame he doesn't exist. It's not for lack of effort. My effort. They just seem to have other things on their mind. Like I said. It's a "Canadian Thing". While we spend millions on Factor and soon Radio Starmaker to "beef up" an Industry in the name of Culture we ignore a truly unique pioneer who never asked for anything. Loretta Lynn debuts Tennessee Museum> May 26, 2001 - Country music celebrities and more than 1,000 of Loretta Lynn's friends, relatives and fans celebrated the grand opening Saturday of a museum dedicated to her life as a "Coal Miner's Daughter" and country music legend. Naomi Judd, George Jones and Lynn's sister Crystal Gayle were among those at the site of the new Coal Miner's Daughter Museum at Lynn's home west of Nashville. The museum replaces an earlier one that had been on the property for years. The museum includes items like Lynn's first bedroom furniture, bought for $200 from a musician in Hank Williams Sr.'s band. The furniture once belonged to Williams himself. "I paid him back $10 a month, 'cause we didn't have any money," Lynn said. The native of Butcher Holler, Ky., was born the daughter of a coal miner in a one-room log cabin. She married at age 13, and had her first child the next year. Lynn scored her first hit "Honky Tonk Girl" by driving coast to coast with her husband visiting radio stations to promote it. As she gained confidence, Lynn began writing and performing more personal songs about her life. The museum includes an old touring bus nicknamed The Coal Miner, and cars driven by Lynn and her husband. Lynn said she wrote "Fist City," a song that threatens violence to a woman who shows too much interest in her husband, in one of the Cadillacs on display. O COUNTRY PRIDE, WHERE ART THOU - Good article on the state of country music today. THE NASHVILLE UNDERGROUND - Interesting (grave) site for lovers of roots country performers. ELVIS FACT: Memorial Day - U.S.S. Arizona Benefit. In 1941 the Japanese attacked Pearl Harbor and sunk the U.S.S. Arizona, entombing 1,177 of the 2,403 people lost that day. On March 25, 1961 Elvis gave a benefit performance in Hawaii, raising $64,696 or over 10% of the total cost to build the memorial. Elvis had returned from duty in the Army the year before and both Col. Parker and Scotty Moore had served in the military in Hawaii. Scotty described the concert as having a "homecoming feel to it". The memorial was dedicated on Memorial Day 1962. Bob Moore's new wesbite, great history on his recording career listed here. Bluesman Willie Foster dead at 79. May 21, 2001 - Internationally known harmonica player Willie Foster died early Sunday of an apparent heart attack, a family member said. Son-in-law Anthony Evans said he found Foster, 79, unconscious in his hotel room early Sunday in Jackson, Tennessee, where the two performed at a private party Saturday night. "We played until 12 and went back to the hotel and he was just as happy as could be," Evans said. "I left for about an hour and a half and came back and he wasn't conscious." Evans, a drummer, said it appeared Foster had a heart attack. Foster had been performing regularly and was scheduled to travel to Norway in two weeks for an engagement, Evans said. An Army veteran of World War II, Foster said he first performed on stage when he was called up to play during a USO show in London that featured Betty Grable and boxer Joe Lewis. Born September 19, 1921, Foster had lost both legs to illness and was legally blind. He said he was born in a field near Leland, Mississippi, where his mother was picking cotton. He said he was told he was born on a cotton sack spread on the ground. Over the years, Foster traveled the world and at times teamed with greats such as Muddy Waters. The two met when Foster was a teen-ager. Years later, their paths crossed again in Chicago. Foster said he discovered the blues in 1928, when he walked into the Rexall Drug Store in Leland, Mississippi, and the owner let him put a harmonica on lay-away. He got his first paying music job in St. Louis around 1950. A request from The Everly Brothers International Webmaster. Just recently we co-operated with Warner Music Europe on the release of all the Everly Brothers material on Warner Brothers (recorded in the 60's) in the forthcoming two years. 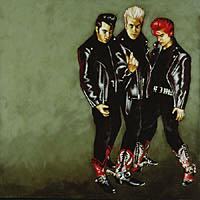 The first release, It's Everly Time/A Date With ... will be out June 5th 2001. All releases will include bonus tracks and alternate takes. As future releases depend on the success of the first one, I would like to ask you to share this information with everyone by referring to our newly created domain at www.everly.net. Here they will find the latest updates. FREDDY FENDER honored by STATE of TEXAS SENATE. Last week Baldemar Huerta, known as Freddy Fender, was recognized on the floor of the Texas State Senate as being an international music star and a tremendous Texas talent who has delighted generations with his recordings and performances. The Senate of the State of Texas voted on a Senate Resolution to honor the legendary performer for all his contributions to Country, Pop, Rock and Tejano music world-wide. Freddy is continuing his dialysis treatments after recently being diagnosed with Hepatitis C and undergoing kidney complications. SONGWRITERS - (in or out of the Nashville area). Complete, affordable demos, vocal and backgrounds done. Rockabilly, country, pop or gospel. Call Eric, 615-466-0774. Recommended by the Rockabilly Hall of Fame! Thank you. 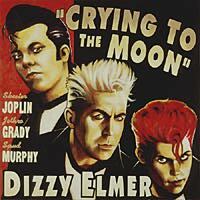 DIZZY ELMER'S NEW RELEASE, 'CRYING TO THE MOON' IS OUT! Recorded in December 2000, Mixed February 2001, Mastered March 2001, Duplicated April 2001, Available NOW! Sort of. Though not yet in stores, it is available right now at their NEW website. http://www.dizzyelmer.com. So tell your friends - NO, buy one for them and show them what a visionary you are. Jimmy Evans, famous for his classic "The Joint's Really Jumping" is intending to record some new material at the Phillips studio in Memphis in the next couple of weeks. He has some new country and rockabilly songs written by himself and friends and hopes to add some of the earlier singles he had out that have not yet been out on cd. For information on the project or for booking Jimmy call him at 870 338 9360. Glen Glenn is featured on the ELVIS HONEYMOON HIDEAWAY WEBSITE. Glen informs us that his classic "Everybody's Movin'" (Glen's own version) will be featured in an upcoming Warner Bros. movie. More news on that later. A "Blue Caps" note from Phil Whyte: "I attended Paul Peeks's funeral. 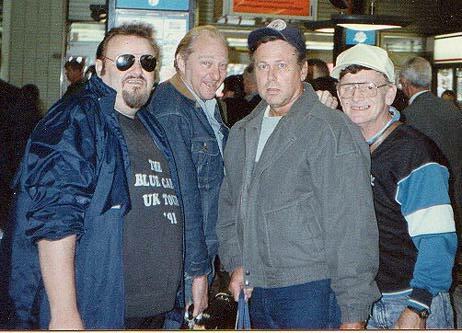 I recently found this nice photo of Paul, Dickie, Bubba and Johnny that I took in '91 at Kings Cross railway station in London - they were on their way to a gig in Newcastle (in the north of England)." A NOTE from NARVEL FELTS. April 22, 2001 - "I just got home from France. Had a full house, 3 encores and a 2-hour autograph line at the Centre Cutural in Mehun-Sur-Yeuve near Bourges. The Sureshots did a great job backing me April 14th. Crazy Cavan & The Goners were also on the show. I did 'Be Bop A-Lula' in memory of Paul, I told them that weeks ago he made his final performance, on stage with me in Atlanta. We did that song together then." The Derailers are forging ahead, signing with Sony/Lucky dog. The Austin-based band previously had been on Sire. The band, who echo Buck Owens musically, look to release a new album in late summer or early fall. Kyle Lehning is producing the disc. Joey Ramone R.I.P. (1951-2001). Joey Ramone (listen to the Punk Show), godfather of Punk and lead singer of the legendary Ramones, died Sunday, April 15, after a four year battle with cancer. Ramone passed away at 2:40 p.m. ET in New York of complications from lymphoma. He was 49. Joey Ramone was born Jeffrey Hyman on May 19, 1951. His career started during the early 1970s glam-rock era, when he played in several New York bands -- occasionally under the name Jeff Starship. He founded the Ramones in 1974 with friends Johnny, Dee Dee and Tommy. Each adopted the surname Ramone, after a stage name (Ramon) used by Paul McCartney during the earliest Beatles days. The Ramones created a new brand of DIY rock based in four chords, punchy hooks and brilliantly simple lyrics that combined gritty, street-smarts with infectious pop charm and undeniable New York attitude. The Ramones also became known for their 1950s hoodlum-inspired trademark look of black leather motorcycle jackets, bowl haircuts, t-shirts, ripped jeans and Converse hi-top sneakers. Joey himself stood towering well over six-feet tall and hidden behind purple-tinted spectacles. His fist-pumping, frontman stance led the Ramones with a "1,2,3,4!" count for over 2,000 shows. In 1979, the Ramones appeared in the Roger Corman movie "Rock'n'Roll High School," recording the title song for the soundtrack. Ten years later they contributed the title track to "Pet Sematary," based on the book by Stephen King. But mainstream crossover success consistently eluded them. Although their fiercely delivered, winkingly inane pop songs about social misfits were hailed as rock classics, none ever cracked the Top 40. Their last real stab at commercial success came in a bizarre 1980 collaboration with producer Phil Spector -- a session that bassist Dee Dee Ramone recalled most for Spector's pulling a gun on the band inside his Beverly Hills mansion. In the past year, Ramone had been working on solo material and organizing shows in New York nightclubs with some of his favorite acts including the Independents and Jesse Malin. He spoke endlessly of Ronnie Spector -- former member of the Ronettes and ex-wife of legendary producer Phil Spector. Ramone worked as co-producer on her 1999 EP She Talks To Rainbows. He had also made peace with former drummer Marky Ramone who worked with Joey on some of his recent solo material. 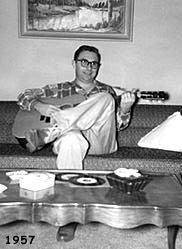 Two photos of writer Bob Center taken at his home in Tyler, TX in the mid-'50s. Bob is the guy who wrote "Flea Brain", and whose demo performance is on the RAB HOF CD #5. BOBBY WAYNE UPDATE: April, 2001. Jerry Dennon is releasing 23 of Bobby's early tracks, including Tip Toes, Big Train, The Valley, Half Breed, Twinkle Toes, Riverman, etc. The title of the CD will be: "Bobby Wayne's Rock 'n' Country Classics." It will be released on Soundworks in the USA and Ace Records in England and Europe. Projected release; Fall 2001. Bobby is also working on a new CD project. Contact Bobby Wayne by fax: 509-326-7783. Rockabilly Hall of Fame inductee GARLIN HACKNEY was in Nashville recently (March 2001), recording ten songs: I Ain't Workin Without You - My Love for You - Wish You Didn't Have to Go - Standin in the Shadows - Nothin' Your Memory Can't do - I Don't Know Where I'm Going - Here Comes the Night ... these 7 are Hack's originals. Credits: keys-Don Bradley, bass-Steve Ledford, fiddle-Aaron Till - all these from Mark Chesnutt's band. steel-Rusty Danmyer from Lee Ann Womack's group, drums-Tim Grogan from the Desert Rose Band. Guitarist: Billy Owens from Hack and the 57s on lead. Produced by Don Bradley. Watch this page for more details. D.J. BILL MACK SAYS GOODBYE TO THE MIC. One of the most prominent and influential DJs in country music history has retired. Bill Mack, who won a Grammy for writing the song "Blue," turned off his microphone on Thursday (March 29) at Fort Worth, Texas, radio station WBAP, where he became nationally famous for his overnight show. Mack, who began in radio in 1951 and worked as an announcer for Bob Wills and Buck Owens, joined WBAP in 1969 and had been there since - save for a six-year spell in the 1980s when the station fired and rehired him. Mack wrote "Blue" in 1958 for Patsy Cline, but it wasn't a hit until LeAnn Rimes launched her career with it in 1996. Bill Mack, the prominent country DJ who retired last Thursday (March 29) from the Fort Worth, Texas, station WBAP-AM, is starting a new program on satellite radio. Mack, whose songwriting credits include the song "Blue," has signed with XM Satellite Radio for a show to begin sometime this summer. COUNTRY MUSIC DJ HALL OF FAME INDUCTEES ANNOUNCED. Five radio veterans will join the Country Music DJ Hall of Fame June 28, during an awards ceremony in Nashville. Terry Burford (KFDI in Wichita, Kan.); Dale Eichor (KWMT in Fort Dodge, Iowa); "Country" Joe Flint (KSOP in Salt Lake City); Rhubarb Jones (WYAY in Atlanta) and the late Chris Lane (syndication specialist behind the shows Legend Makers and Christmas in the Country) will be inducted by Country Radio Broadcasters, producers of Nashville's annual Country Radio Seminar. To qualify, deejays must serve at least 25 years in country radio and contribute to country radio's growth and development and to the preservation and enhancement of country music. In addition, Mike Lynch will become the first inductee in the CRB's newly established Country Radio Hall of Fame which honors country radio staffers whose achievement was not limited to on-air work. Lynch began his broadcasting career in 1948 at KBYE in Oklahoma City and later owned a number of radio stations in the U.S.
KIM LENZ AT HOME FOR THE NEXT FEW MONTHS. Congratulations to Kim on the arrival of Riley Scott Lenz last month (Feb.). It looks like Kim will have her hands full for the next few months, but she hopes to start on a new record in the summer. Bass player Shawn Supra is currently playing with Wayne 'The Train' Hancock. They are touring quite a bit so be sure to check them out when they come through your town. Drummer Scotty Tecce has been staying busy with his doo-wop band The Fabulous Harmonaires. They can be seen at the Viva Las Vegas Rockabilly Weekender on Sat, April 14. Guitarist Tom Umberger has also been busy with two bands. Both The Racketeers and The Stumbleweeds will also be appearing at this year's Viva Las Vegas Weekender. Benny Martin, Born May 8, 1928 in Sparta, TN - Died March 13 at the age of 72. Benny Martin was one of bluegrass music's premiere fiddlers and the inventor of the 8-string fiddle. Born to a musical family in Sparta, Tennessee, he made his debut on a local radio station when he was only eight. He played in a local band for a while and when he was 13 went to Nashville to work with Big Jeff and the Radio Playboys at WLAC. He remained with the group for nearly ten years, and also began working as a session man for Dot Records. Martin also recorded a solo album on the Pioneer label; one of his early singles, "Me and My Fiddle," became his signature song. 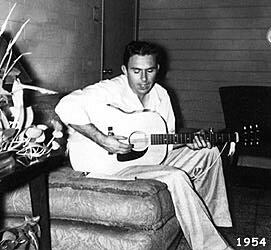 Frequently, Martin worked as a sideman for such performers as Bill Monroe, Roy Acuff, Kitty Wells and Flatt & Scruggs. He founded his own band in 1954 and also briefly joined the Grand Ole Opry. During the mid-'50s he was managed by Col. Tom Parker and opened for Elvis Presley 35 times. This was not a great time to be a country performer, and Martin began doing more session and sidework than solo recording. In 1963 he had his only chart hit, "Rosebuds and You." In the mid-'60s, he briefly teamed with Don Reno and recorded a gospel album. Martin continued working behind others, performing at festivals and recording frequently on various labels through the early '80s, when his health began failing. STAN BEAVER Is now booking for the spring/summer season. If your venue or company uses live entertainment, you need to check this out. Stan Beaver has been a professional entertainer since appearing on his father's TV show in Atlanta, GA. at age 5. The show is a good, clean, family show. NO off-color material of any kind! Stan has worked with many famous people in his career. People like Tom T. Hall, Jeannie C. Riley, Carl Perkins, Ray Charles, Hoyt Axton, Faron Young, and the Righteous Brothers, just to name a few. 'Way back in 1963 (he was just a kid then) Stan went in to RCA Recording Studio in Nashville and recorded a song called "I GOT A ROCKET IN MY POCKET" (Petal Records # 1012) Just a little novelty song about beating the Russians to the moon....but it got a lot of radio and TV airplay. Now the original records are collector's items worth $35 to $50, if you can find one in good condition. "I GOT A ROCKET IN MY POCKET" has been re-issued, world wide on several various artists LP's and CD's in Germany, England, Australia and most of Europe. Stan's newest recording is a CD featuring the original 1963 recording of "I GOT A ROCKET IN MY POCKET" and other vintage recordings, PLUS some newly recorded material. We KNOW you'll like it! And a new CD of Contemporary Christian music, most written by Stan himself. On May 8th, 2000, due in part to "I GOT A ROCKET IN MY POCKET" Stan was inducted into the "ROCKABILLY HALL OF FAME". An honor not given to just anyone. He's in good company with such Rockabilly heroes as Jerry Lee Lewis, Carl Perkins, and Roy Orbison. Stan and his dad (Leon Beaver) worked together on stage for many years until his dad passed away in 1999. But now a new generation is coming up. Backing Stan on drums is his own son, Joel Beaver. Joel is only 13 years old but is already a seasoned professional drummer, having played both concert and recording dates with his dad and others. "The Stan Beaver Show" is a wholesome, family oriented show, featuring: Rockabilly oldies, classic country music and comic impressions of famous entertainers including Elvis, Bill Anderson, Johnny Cash, Hank Snow, Ernest Tubb, Willie Nelson, Waylon Jennings and many others. If you're looking for some great entertainment for your place of business or private party, have we got a show for you!! !